If you know me, it’s pretty obvious that I like waterfalls and Oregon has some of the best. Fun Fact: Oregon state has the most waterfalls in the country with 226. With that many waterfalls and all the books about them, along with social media photos, it's surprising how few of them are regularly visited. It seems like only a handful of falls get any love. 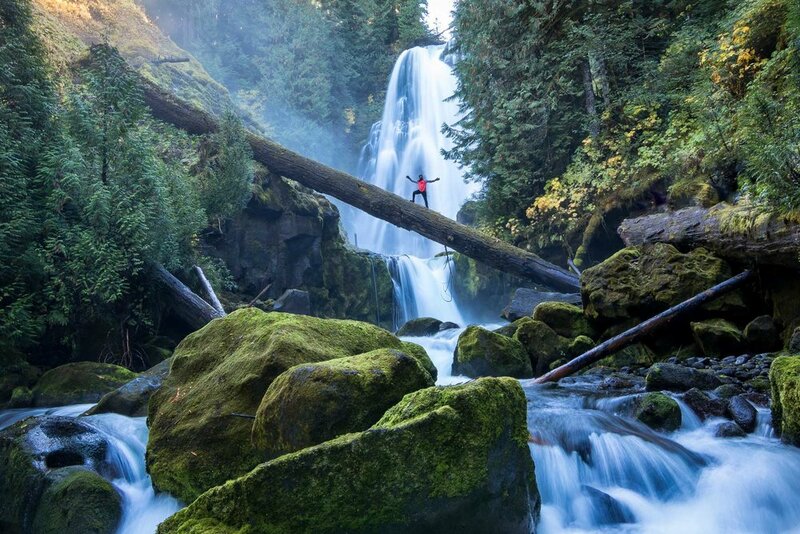 Only a few hardy souls tackle the off-trail challenges to reach the many secret falls. You can hear tales of secret falls online or in conversations while hiking but when it comes to figuring out how to get there, the trail becomes as hard to track as Bigfoot. Many times, an image of a beautiful waterfall will be posted but the name will have been purposefully omitted or obfuscated. While there are books with the coordinates for most of the waterfalls, nothing is as good as first-hand knowledge of how to get there. Trying to find a good one can be like hunting for your own personal white whale. This is where Rush Creek Falls comes in: my first foray into searching for off-trail waterfalls. While not totally unknown, Rush Creek doesn't have a trail and therefore doesn't see many visitors. It’s a fairly large waterfall with a drop of about 200 feet deep in the Gifford Pinchot National Forest in Washington. Using some simple Google-fu you can see that it’s just a couple miles up a creek off a National Forest road. Foreshadowing ­— relying on Google may not always be the best idea. A hiking group I am part of decided to make this one of our adventures. We did some research online looking for trip reports and surveyed the area using Google Maps (hint: Google shows the falls in the wrong place). With this information in hand we headed out into the woods. “It’s just a couple miles up the creek...." Famous last words. The hike up the creek was like nothing I’d ever experienced before. The walls were steep, the underbrush was dense and the number of downed trees and branches was hard to fathom. It looked like no human had ever delved into the woods despite the stories we had read online. Or, maybe they were just more badass than me. The rugged terrain made for pretty slow going. Actually, I think the only way it could have been slower is if we had just sat down. We were averaging a half-mile per hour. After three hours of hiking we had made it a whopping 1.5 miles and were met by sheer cliff walls. Off to the right we could barely make out the white of the cascading waters but there was no way to get there. The cliff walls were too steep and the creek was flowing too much to cross safely. Knowing that we had another three hours to get back to the cars we decided to chalk this up as a learning experience and get out before dark. Hike stats: roughly 3 miles in 6 hours. Jump forward a couple months and the topic of Rush Creek Falls came up again in our group. There was no way we were going to give up after one attempt. Further researching and talking to some people who had actually been there gave us a better plan of attack. And by better I don’t really mean easier. This time we were going to follow a decommissioned road for a few miles then drop down into the canyon to see the falls. Sounds simple, doesn’t it? Decommissioned means that the forest service had ripped up all the asphalt and dug some trenches so people can't drive on it. This opened the way for trees and underbrush to come up and basically take the road back to its almost-natural state. Then you have the drop into the canyon. The drop is a 600-foot descent over a third of a mile. To put it in perspective: the canyon was so steep that you could reach out and touch the uphill slope without bending over. We set off early, and there was frost and ice on the ground. The day started with shimmying across a different creek on a somewhat icy log but after that it things got a little easier. While there were trees and stuff growing in the old road, it was still fairly easy to stay on track and we made good progress, quickly reaching the canyon. We had to bushwhack our way to the top of the canyon and then hike — read slide and scramble — our way to the bottom trying to avoid any sheer cliffs. Once at the bottom, we slid through a sea of Devil’s Club and popped out onto the shore of the creek just below the waterfall. A short scramble across some boulders put us in full view of the falls. The waterfall was everything I had hoped it would be and more. I’m sure some of this is due to the fact that the first attempt was a failure, but I’ll take it. Everyone in the group was ecstatic, scrambling around and taking pictures. One of the guys even climbed half way across a log 20 feet or so above the creek. Final hike stats: 5.9 miles, 5 hours and 1,000 feet of elevation. Almost all the elevation change came in the last one-third of a mile. All in all the adventure was definitely worth it. The scrapes and Devil’s Club thorn pricks will fade over time, but the memory of the adventure won’t. We are all now part of a small number of people that have made it to the falls.